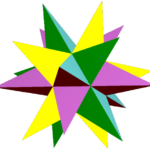 Of all the great thinkers of the past, the one I would most like to meet is Johannes Kepler (1571 – 1630), saying in response to the religious wars going on around him, “There was nothing I could state that I could not also contradict.” This is a classic expression of all-inclusive, both-and thinking, showing that his innate intelligence was not completely stultified by the culture in which he lived, as is normal. As a near graduate in theology, he was determined to make it a practice to investigate the truth for himself rather than take any authority’s word for what the scriptures might say. Galileo did not understand the man, perhaps because of this fanciful diagram in Kepler’s Mysterium Cosmographicum (The Secret of the Universe) from 1596. So arrogantly thinking that he was the foremost astronomer in the world, Galileo did not read Kepler’s New Astronomy, which laid down the foundations of modern astronomy in 1609. If he had, perhaps he would not have got into trouble with the Catholic authorities, although Galileo’s difficulties were as much about personal animosities as revolutionary ideas. Even today, the English translation of Astronomia Nova is out of print and in few libraries, while Galileo’s inferior Dialogue Concerning the Two Chief World Systems from 1632 is readily available. In contrast, Einstein fully appreciated the inventive power and the tireless, obstinate way that Kepler extracted secrets from the heavens, calling his method for calculating the orbit of the Earth around the Sun by imagining that he was standing on Mars ‘pure genius’. Today, we need to stand even further outside ourselves if we are to solve the problem that Einstein wrestled with during the second half of his life. For myself, seeking to understand more about the first scientific revolution, I began to study Kepler’s life and work in some depth in 2010, when I was writing an extensive chapter in the Wholeness trilogy on ‘The Evolution of the Mind’ from its earliest beginnings. To this end, I visited the island of Hven (Ven in modern Swedish) in Öresund between Sweden and Denmark, where the Danish nobleman Tycho Brahe had had his observatory in the late 1500s, taking the most precise measurements at his time of the stars and planets, as ‘wandering stars’. Before this, my principal source of information had been Koestler’s The Sleepwalkers, in which he described Kepler as the real hero of the heliocentric revolution, a classic case of sleepwalking, as the human mind fumbles its way towards the truth of life on Earth. On Ven, I discovered Kitty Ferguson’s delightful book The Nobleman and His Housedog: Tycho Brahe and Johannes Kepler—The Strange Partnership that Revolutionised Science. 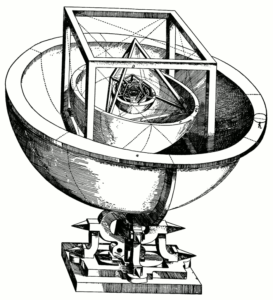 Basically, Kepler needed Tycho’s meticulous measurements of the movements of the planets to confirm his polyhedral model, described in Mysterium Cosmographicum, in which he postulated that there is a Divine force emanating from the sun which drives the planets around in their orbits, which we now know as gravitation. But these measurements were not easy to obtain. Despite Kepler’s impecuniosity as a mathematics teacher and their quite different social backgrounds, the two men eventually met in Prague in 1600 after Tycho had been appointed Imperial Mathematicus to the Holy Roman Emperor, Rudolf II, as much concerned with astrology as astronomy. But when Tycho bizarrely died suddenly of a bladder infection the following year, Kepler was appointed in Tycho’s place with the official job description to publish Tycho’s star catalogue, consisting of the measurements of a thousand stars and the five known planets outside Earth. There was just one difficulty. Tycho’s instruments and measurements did not belong to the Emperor; they belonged to the Brahe family. Tycho’s son-in-law was particularly concerned with the fame and fortune that the Brahe family could derive from publication of these measurements, leading to a tug-of-war that lasted twenty-five years before Kepler fulfilled his job objective with the publication of the Rudolphine Tables in 1627. Of course, it is not possible to provide a running commentary on the vicissitudes of our lives, like a director’s optional commentary on the DVD copy of a movie. For the most part we live our lives without full awareness of what we are doing, addressed to some extent by the practice of mindfulness in Buddhism. But if evolution is to become fully conscious of itself within us, we need something of Kepler’s approach to scientific discourse to complete the final revolution in science, making explicit what is normally implicit. Biographies and psychobiographies provide some insights, and those written by the experiencer even more so. It is some of these issues that I am addressing on this website and in my books and essays. There was another key issue that Kepler recognized: there wasn’t a ready readership for his book. Not only was he changing circular motion into elliptical, Kepler was also unifying the split that Aristotle had opened up between mathematical astronomy and causal physics in Physics. Yet, at the time, academics were either mathematicians or physicists, not both. We have a similar communications problem today. In general, people are either mathematicians or mystics, but not both. And, as there are few generalists, many are experienced in neither specialism. 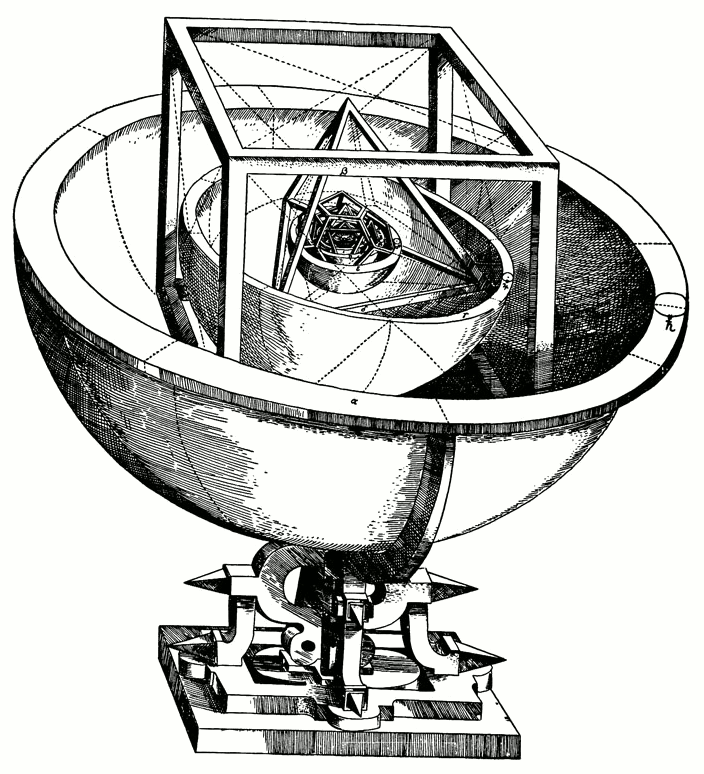 But even after it was complete, Kepler’s difficulties were not over. Before it was published, he needed permission from the Brahe family as Kepler had based his calculations on Tycho’s measurements. So it took another four years before New Astronomy could be published. In the 1610s, Kepler then set out to complete his investigation into the unifying patterns that underlie all aspects of human endeavour, integrating geometry, music, poetry, psychology, metaphysics, architecture, and astronomy into a glorious whole, a study that he had sketched out in the summer of 1599. This was published in 1619 as Harmonice mundi ‘The Harmony of the World‘, as a follow-on to Mysterium, which was published in a second edition in 1621. Harmonice mundi contains the third of Kepler’s laws of planetary motion: “the proportion between the periodic times of any two planets is precisely the sesquialterate proportion of their mean distance”. Although Galileo was not aware of Kepler’s three laws, Newton read his books and incorporated them into his notion of gravitational action at a distance, which Kepler, himself, had come close to discovering. In the geometric section of The Harmony of the World, Kepler gave illustrations of the thirteen Archimedean solids, as well as the small and great dodecahedra, which no one had previously discovered. 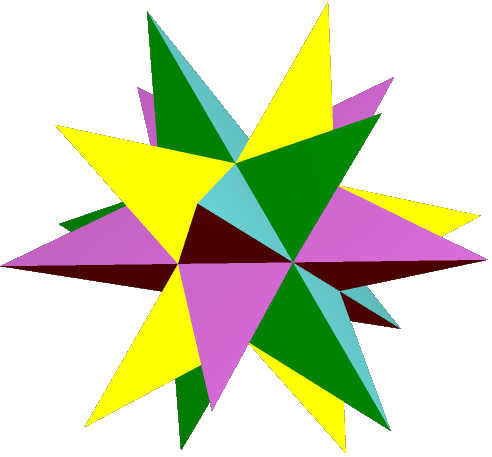 In two dimensions, he attempted tessellations with pentagrams and other figures with pentadic symmetry, which, of course, is not possible. 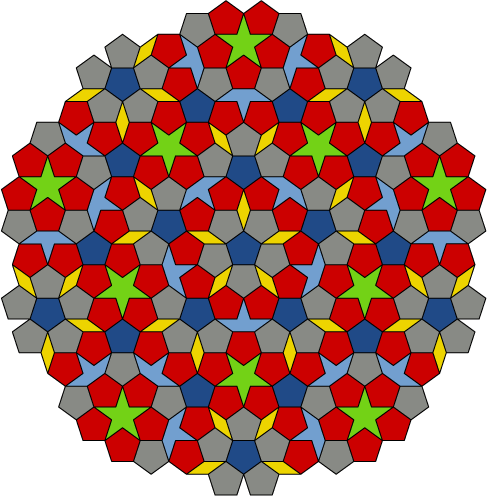 Nevertheless, Kepler’s endeavours inspired Roger Penrose in the 1970s to explore aperiodic tilings, called pentaplexity. While Kepler was pursuing his official and unofficial careers, there was great religious turmoil going on all around him, culminating in the Thirty Years’ War from 1618 to 1648. He was born into a Lutheran family in Swabia in the Duchy of Württemberg in south-west modern Germany. His grandfathers were Bürgermeisters or mayors of their respective towns. However, Kepler’s father Heinrich was a mercenary, often away from home fighting wars, which, it seems, he continued at home. Kepler described him as “vicious, inflexible, quarrelsome, and doomed to a bad end”, which apparently happened when Kepler was seventeen, for his father disappeared from home, never to be heard of again. Nevertheless, the Duke of Württemberg took an enlightened approach to social matters, giving those who merited it a free education to university level. This led to Kepler winning a scholarship to Tübingen University to study theology for three years, preceded by two of general studies. But he had unconventional religious views, which stemmed from hearing a Lutheran preacher condemning Calvinism at the age of twelve. Kepler wanted to have nothing to do with religious bigotry. In the pursuit of World Peace through Inner Peace, I had a similar insight at a similar age, when I was confirmed into the Church of England, not through inner conviction but because this was what my parents expected of me, at what is supposedly the ‘age of discretion’. Nevertheless, I remember feeling at the time that I wanted to be a priest, but not a Christian priest. As I didn’t know what that meant, I became a mathematician, like Kepler. For six months before he completed his theological studies, he was appointed as District Mathematician at a Protestant school in Graz in Catholic Styria, being the one most “likely to bring honour to Tübingen University”. This school was using the new Gregorian calendar, which Kepler favoured and promoted, also attempting to stay friendly with his Catholic neighbours. To no avail. After four years at Graz, the young Archduke, seeking to win favour with the Pope in the Counter-Reformation, ordered all middle-class Protestant inhabitants out of Graz if they were not willing to convert to Catholicism, which Kepler refused to do. For he called himself catholic, in the literal meaning of the word, ‘regarding the whole’. 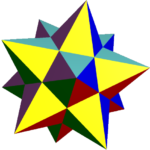 In the event, Kepler had written his first book by then, which led him to become the Imperial Mathematician in Czech-speaking Prague. After eleven years, there was great turmoil in the city as Matthias deposed his older brother Rudolf II as the King of Bohemia, later also becoming the Holy Roman Emperor. Kepler then sought to return to Württemberg in some capacity, such as a professor of philosophy. But this was refused on the grounds that he did not hold rigorously to Lutheran doctrine, becoming an exile from his home country. 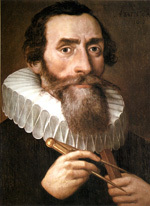 So Kepler became the District Mathematician in Linz while still holding his official position as Imperial Mathematician. However, the Lutheran priest there refused to give Kepler communion; he was effectively excommunicated. But this period in Linz was not to last. After fourteen years there, he was expelled from his home once again. Despite serving two emperors as court mathematician, he spent the last four years of his life seeking somewhere to settle with his family, another cause of much distress. Kepler had first married Barbara, a well-to-do widow in Graz, the mother of a seven-year-old daughter Regina, having five children with her, two dying soon after birth and a favoured son Friedrich at ten in 1611, when Barbara also died. The other daughter Susanna and son Ludwig did grow into adulthood having children with descendants alive today. Needing a mother for his children, Kepler married a second time in Linz, choosing Susanna from one of eleven ‘candidates’, not because she was the most socially suitable, but because she “had the advantage through her love, and her promise to be modest, thrifty, diligent, and to love her step-children”, as Kepler wrote in a letter to an anonymous nobleman. Kepler had seven children with Susanna, the last in 1630 shortly before he died in solitude, seeking somewhere to live. But, as well as Regina, three of these children died before Kepler and two more shortly after, leaving the remaining two as orphans, when Susanna also died. Of these two children, only Cordula is known to have had survived into adulthood, having children of her own. Unlike Tycho, Galileo, and Newton, even Kepler’s burial place no longer exists, the Swedish army desecrating the churchyard in Regensburg, where he was buried, a couple of years after he died. One other family matter needs to be mentioned. When Kepler was living in Linz, some malicious neighbours of his mother Katharina accused her of witchcraft, punishable at the stake, a saga that went on for six years. Eventually she was imprisoned for fourteen months and threatened with torture if she did not confess. In the end, Kepler managed to get the charges against his mother withdrawn and she died peacefully six months after the Duke of Württemberg absolved Katharina of the charges against her. Not surprising, Kepler was not without money problems. When he and Barbara were expelled from Graz, he tried to claim his wife’s inheritance from her father’s estate when he died. But the Catholic authorities would not allow this, confiscating her property. Nor were his financial difficulties over during the thirty years he spent as the Imperial Mathematician. The coffers of the Holy Roman Emperor were threadbare, and Kepler had much difficultly getting the remuneration due to him, Susanna and Ludwig pursuing his claims after his death. Given all this social and familial turmoil, it’s amazing that Kepler maintained his equanimity, achieving what he did in mathematics, science, and philosophy. There was a true nobleman, a man very much after my own heart.